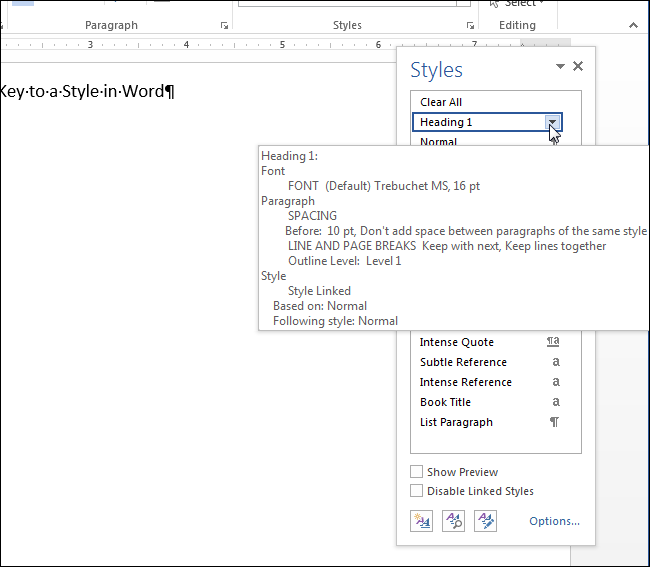 Paragraph and character styles in Word are part of the basic structure of every document you create in Word. When you use either the built-in styles, or custom styles you’ve created, you might want to use the keyboard to quickly apply the styles to your content. 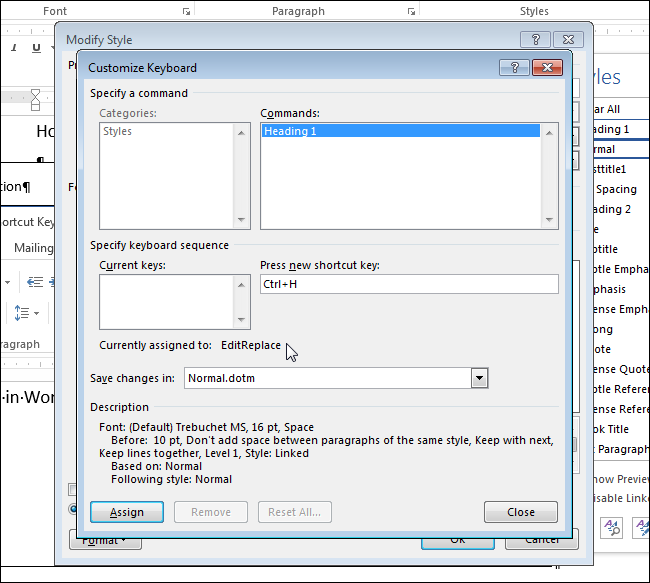 Shortcut keys can be applied to both paragraph and character styles. 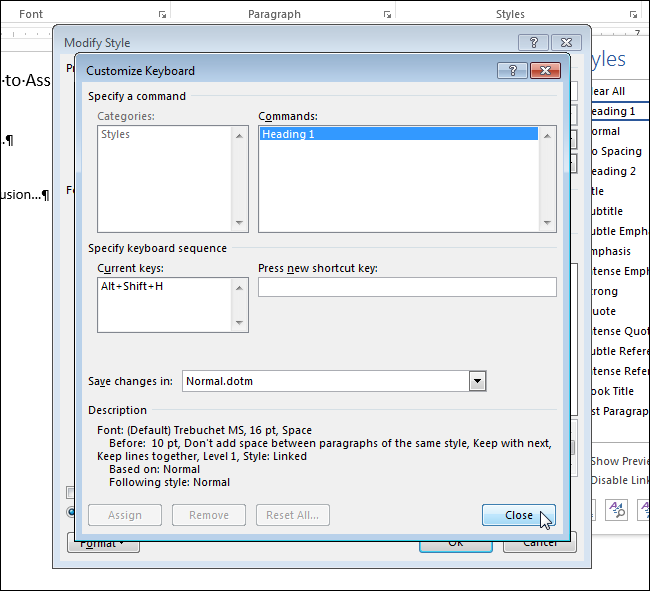 To be able to apply styles using the keyboard, you can assign shortcut keys to styles. If the “Home” tab is not currently the active tab, click the “Home” tab to activate it. In the “Styles” section of the “Home” tab, click the “Styles” dialog button in the lower-right corner of the section. 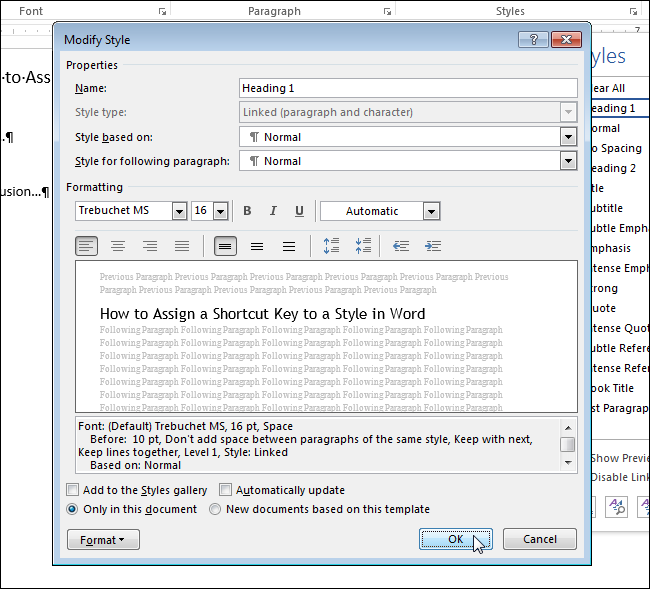 The “Styles” pane displays. 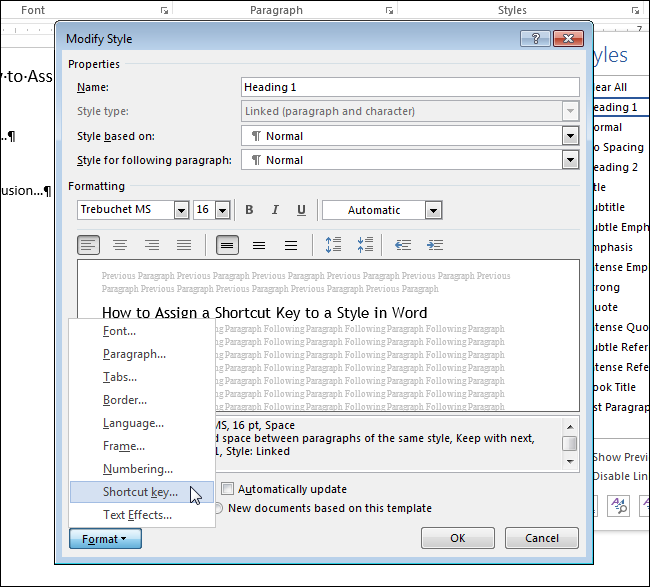 When you hover your mouse over a style, formatting details for the style display in a popup window. 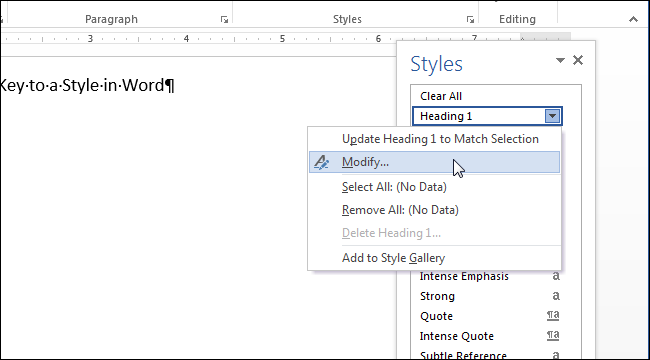 Click the down arrow on the style and select “Modify” from the drop-down menu. 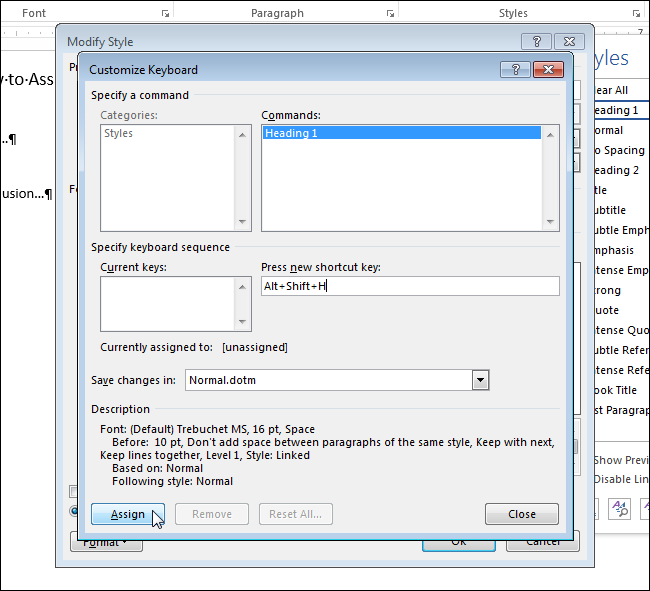 On the “Modify Style” dialog box, click the “Format” button in the lower-left corner and select “Shortcut key” from the popup menu. Click in the “Press new shortcut key” edit box, press the shorcut key combination you want to use to apply this style, and click “Assign”. 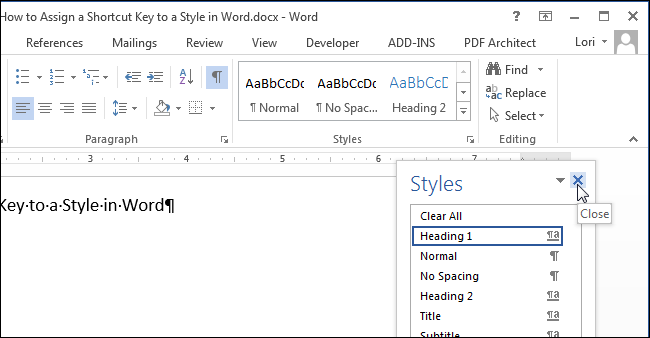 NOTE: If you press a shortcut key that’s already assigned to another function, Word tells you which function the key combination is “Currently assigned to”. Enter another shortcut key combination. The chosen shortcut key combination is added to the “Current keys” list. Click “Close”. You are returned to the “Modify Style” dialog box. Click “OK” to close it. To close the “Styles” pane, click the “X” button in the upper-right corner of the pane. Now you can use the shortcut key combination you assigned to the style everywhere you want to apply it.